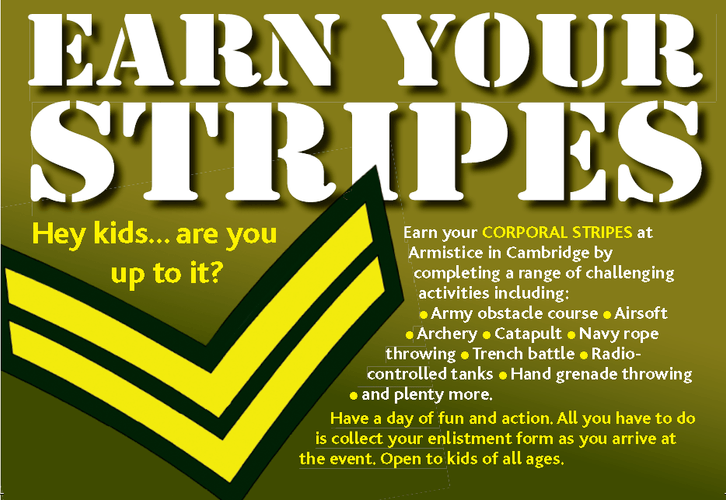 Kids - come and "Earn your stripes" by completing a range of challenging activities including: army obstacle course, Airsoft, archery, catapult, navy rope throwing, trench battle, radio-controlled tanks, hand grenade throwing and more... Collect the enlistment form as you arrive. At Armistice in Cambridge the history and pageantry of New Zealand’s military past is recognised, through the displaying of militaria, old and new – from tanks and trucks and weapons and uniforms, through to aircraft, boats and models. The event features a huge range of militaria for sale. Come and see the NZ Navy displaying their boats and watch aerial displays of historic aircraft. A popular feature of the Armistice in Cambridge weekend is the battle re-enactments, designed to demonstrate the various weapons, tactics and battles that have been fought in the past. To commemorate 100 years since Gallipoli, there will be a battle re-enactment of Gallipoli. As well as featuring World War One and World War Two scenarios, there will be re-enactments of Kiwi involvement in the South African War, New Zealand Wars of the 1800s, the Vietnam War, and more. Displays of even further back to the ancestry of many Kiwis, shows battles involving Romans, Vikings and other such interesting combatant clans of history past. Family fun, at a very realistic price!